Last year, riding a wave of excellent pitching, timely hitting and unlikely heroes, the Pirates jumped out to a 47-43 record, entering the All-Star break above .500 for the first time since 1992. On July 19 they were 51-44 and in sole possession of first place in the N.L. Central – the latest in the season they had been atop the division since 1997. Then a week later, Jerry Meals happened. They lost 11 of their next 12, 18 of their next 27, and 47 of their final 72 to finish 24 games back in the division. The 2011 Pirates ultimately weren’t built to sustain success for six months. While they seemed destined to break their 19-year lease on futility and move into the penthouse of the N.L. Central, they only had enough talent and depth to compete for four months, and were eventually evicted back to their cellar-dwelling apartment. 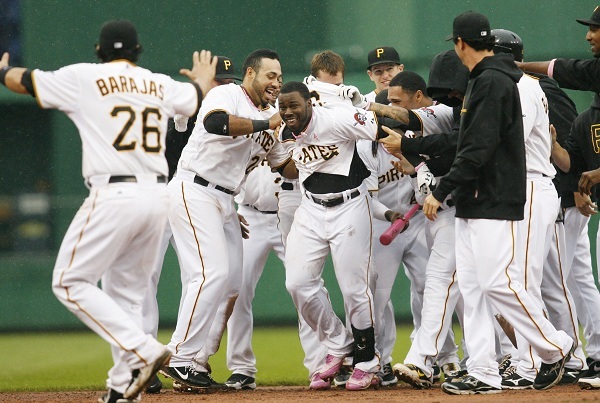 The 2012 Pirates entered the All-Star Break at 48-37, one game ahead of the Cincinnati Reds. They have used the same formula as 2011 – excellent pitching (See: James McDonald, A.J. Burnett), timely hitting (23 comeback wins; six walk-off wins), and unlikely heroes (See: Drew Sutton). Yet, somehow, this season seems different. This year’s team seems to be built on a more sturdy foundation, capable of competing through September and allowing for optimism, albeit cautious, entering the final 77 games. The Pirates hot start in 2011 was fueled by Kevin Correia, their “ace” at the time, who went 4-2 with a 2.90 ERA and 1.09 WHIP in April. His production was unlikely to be sustained over 30 starts, and it wasn’t, as he finished the season with a 4.79 ERA. Behind him was Charlie Morton, who overhauled his delivery and his approach; James McDonald, who at the time had never thrown more than 71 innings in a season; Paul Maholm, coming off a 5.10 ERA in 2010; and Jeff Karstens, who started the season in the bullpen. This season the Pirates have two legitimate aces in McDonald and A.J. Burnett. While they both still have questions marks (Will McDonald eventually wear down and lose his newfound command? Will Burnett continue to be a model of consistency, which he hasn’t shown in several years? ), they have more talent, potential and, in Burnett’s case, longer track records of success than anyone in the rotation of 2011. When the Pirates hit rough stretches, which they will, they can stop the bleeding – just like they did in late-June when they won back-to-back games in Philadelphia, helping the Pirates end a three-game losing streak and earn a split of the four-game series. If Karstens can stay healthy and keep throwing strikes, and Erik Bedard can regain his command and his ability to miss bats, the backend of the rotation should also be able to keep them in games late into the season. But if you want tangible evidence that this season’s rotation is better than last year’s, consider this: In 2011, Correia was relied on to be the stopper atop the rotation. In 2012, he is arguably the 5th starter. In the second half of last season, the pitching fell apart. When the starters began to wear down, there weren’t many internal options available to rescue them. Brad Lincoln made eight, mostly ineffective starts (4.72 ERA); Ross Ohlendorf battled injuries all season and went 1-3 with an 8.15 ERA in nine starts; and Jeff Locke showed he wasn’t quite ready for the big leagues, going 0-3 with a 6.48 ERA in four starts. Stress has been prevalent through the first 85 games of the 2012 season also, as the Pirates have played in 34 one-run games, with the bullpen shouldering a heavy dose of innings (260.1, third most in the N.L.). But this year, the Pirates have legit MLB-caliber help waiting in AAA in Rudy Owens, Justin Wilson and a more seasoned Locke, all three capable of performing, at the very least, at or above replacement level. In addition, Lincoln has shown incredible value as a swingman in the bullpen and spot starter in the rotation, similar to the way Karstens did prior to joining the rotation full time last season. Meanwhile, Karstens, who tired down the stretch and struggled over his last seven starts in 2011 (6.57 ERA), will ultimately benefit from missing several weeks earlier this season with shoulder and hip injuries, and should be well rested come September. This just in: Andrew McCutchen is really good. Always touted as a five-tool player, those that watched him every day last season saw him struggle in the second half, striking out too often and failing to get on base. He changed his swing this off-season, focusing on opening his stance to improve his balance and timing. Early results indicate he has his timing and balance in line. You know the stats (.362/.414/.625), and those around baseball are beginning to take notice. McCutchen has become a legitimate MVP candidate and easily one of the top five position players in the game. If anyone is capable of carrying a team into October, it’s a 30/30-caliber, up-the-middle defender just entering his prime. The Pirates opened this season with arguably the most difficult schedule in all of baseball, playing 16 of their first 25 games on the road, with 22 of them against teams who had winning records in 2011. They survived that stretch, and the payoff will come in the first three weeks of the second half, when they play 19 straight games against teams with losing records. Of those 19 games, nine are against the Cubs and Astros (.388 and .384 winning percentages, respectively), as are 13 of their final 29 games of the season. On top of the easier competition, the Pirates will also benefit from the addition of the extra Wild Card for the 2012 season. If last year taught the Pirates anything, it’s that the final three months of the baseball season are unpredictable, unrelenting and unforgiving. And with players like Cole Hamels, Zack Greinke and Justin Upton being shopped, the trading deadline could dramatically alter the landscape in the N.L. But unlike last year, this Pirates team is built to withstand adversity, be it in the form of an injury to the rotation, prolonged slumps, or even Jerry Meals.